Life has a way of dealing some hard hands every now and then. The world has a tendency to leave you feeling stressed, hopeless, or unhappy at some point, no matter if that’s due to your family, job, health, or finances. Of course, once you’ve begun the habit of spending money in correlation to your emotions, like other emotion-fueled habits, it can be difficult to know how to make it stop. 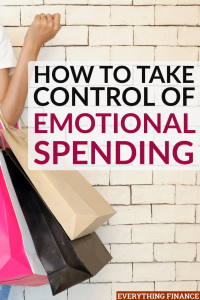 If you find yourself in a similar situation, try these tips to take control of your emotional spending. Credit cards have a sneaky way of making it seem as though you have more money than you really do. Since it’s not physical cash or even your cash in the moment, you don’t feel or think about the amount your spending with credit cards in the same way you do with cash or debit. Hence why most people spend much more with a credit card than they normally would. If you find yourself in the trap of emotional spending, it’s best to leave your cards safe, at-home and limit yourself to only using physical cash. Before you head out for a shopping spree, take a second to consider how you’re feeling and why you want to shop in the first place. Instead of putting yourself in a potentially expensive situation, think about your emotions. If you had a particularly stressful or bad day, you may want to reconsider your shopping trip. Simply stay home. Yes, it will be hard at first. But, by evaluating the emotions that trigger a need to binge-shop, you can take yourself out of a spending-happy situation and eventually recognize the fact that you’re not shopping for a purpose, but instead, as a coping mechanism. If you’d like to treat yourself on occasion or would merely like to wean yourself from this habit, a great idea can be to create a special, fun budget for this particular reason. Set aside a set and affordable amount of cash that is utilized for this purpose and this purpose alone. That way, the next time you’re tempted to spend, you won’t be able to overdue since you’ll have a set limit. When you shop alone it’s all too easy to purchase things you don’t need. As humans, we have an uncanny ability to rationalize the need for things, we don’t really need or want, to ourselves. Furthermore, if you’re already feeling sad, bored, or lonely, shopping alone can sometimes perpetuate those feelings, which only leads to more emotional spending. Unsubscribe from all the retailers you receive emails from. By doing so, you’ll eliminate ads for items you’d like and keep tempting offers and discount emails at bay. Moreover, eliminate items from your cart on various websites. It’ll prevent companies from emailing you to ask if you’d still like it and prevent you from pulling the trigger and purchasing it. Of course, the greatest way to keep impulse and online shopping at bay is to simply cut down on how much time you spend on a store’s online site. Try to limit yourself to only doing the tasks that are actually needed on your computer and then move on to other things offline to reduce your risk of browsing and online shopping. The most important step you can take to take control of your emotional spending is to find other outlets for your emotions. Shopping is a wonderful distraction and entertainment when you’re bored, stressed, or unhappy. After all, we use the phrase instant gratification for a reason; it satisfies us as consumers. However, the next time you’re feeling blue or bored, don’t rush to shopping as your first line of defense. Shopping is fun. It’s as simple as that. Plus, when things in your life are stressful or aren’t going your way, it’s rewarding to treat yourself to something new. Unfortunately, if emotional spending becomes too much of a habit, it can reach a point where it’s no longer fun and more harmful than helpful. Thankfully, just because somethings become a habit doesn’t mean it has to be a habit forever. Through a few useful tips and tricks, you can gain control of your emotional spending and find other, more beneficial ways to handle life’s difficulties. Have you fallen trap to emotional spending? What are some alternate activities you’ve found helpful?